The Mariedian faction has been one of my favorite VC factions to play over the past 7 years, and it’s always fun to see additions to that faction, due to the built-in synergy. Rendar Fy is one of the cheapest options for a ranged multi-attacking hero. If you don’t count fillers like Guilty and explosions like Johnny and James, only Josie Whistletop comes in at a lower cost. And anybody who’s played ‘Scape for a hot minute knows that ranged multi-attackers are some of the best units in the game. Let’s use Josie for a comparison: Rendar’s survivability (4L/4D) is better than Josie’s (5L/2D), and his maximum attack output (2 attacks of 4 at 5 range) is probably slightly better than hers (attacks of 4, 3, and 2 at 5 range). Add in some Mariedian movement boost and the ability to have 8 range when necessary, and 85 points seems fair. Pretty straightforward here. Rendar has a rifle, and if he’s got time to concentrate on his shot, he can either shoot far or shoot fast. If he’s got a perch to shoot from, he’s extra deadly. Fair enough. Battle Rifle is an interesting take on a double attack. It usually plays as a range-limited double attack, but against high-range armies (like the Merry Men) the range boost also has some use. Sighting is a good power, and it’s nice to see something familiar alongside something new. Looking at Rendar, you may not think of him as a map-dependent figure. Usually we reserve that designation for figures like Drudge or Obsidian Guards or Dzu-Teh. But while those figures are terrain-dependent, Rendar is height-dependent. On some flatter, modern maps, he’s flat-out terrible. If much of the map is the same level, he’s almost never worth an OM. His (limited usage) 2 attacks of 2 are definitely worse than the M-43’s 3 attacks of 2. And even on maps with decent height variation, if he gets beat to the top, he can be in pretty bad shape. That said, if you get Rendar Fy to the height, he starts to be worth getting some turns with. One of the biggest problems with the Mariedians is their lack of gradation in attack potential. Jarek Guy can throw 5 dice in melee, but until now their only option for multiple attacks of 4+ was a partially destroyed squad of B-11s. Rendar gives you some staying power to that kind of middle-power middle-repetition attack output. Again, this only works if you can ensure getting him on height. Guerilla Tactics is a great way to get Rendar to height, but it has a few problems. It is rather slow, especially to get to height, which by definition takes up those 3 move points faster. It’s also not reliable on R1T1, which means you often have to put an OM on Rendar to move him the rest of the way to height. That OM loses you an attack, since you’re going to be moving him, but if he can stick on a perch, he’ll make his points up decently quickly, doing what I like to call ground control*. Of course, 4L/4D has a tendency to be a swingy survivability combo. 4 defense is enough to block 2 skulls with some reliability, but whiffs are common as well. A few of those whiffs at a bad time and you’re left with a wasted OM that could have gotten you some good attacks. Rendar was at times frustrating to play. Sighting makes him a very height-dependent figure, and it’s sometimes hard to get him there. That said, the limits on his powers keep his high potential in check, and he ends up quite balanced, and a nice addition to M-43 armies. *this one is for you old-timers out there: Rendar Fy is based on a design capsocrates made for Soundwarp’s Speed Custom Contest 3, all the way back in June 2013. That design (90 points and human, but otherwise identical) was called Major Tom. She maxes out a DnD Large Single Base. Paizo has at least 99 at $8. I leave her in your very capable hands. Thanks for your consideration. Last edited by Lamaclown; December 8th, 2018 at 02:46 PM. The text of the card still refers to "this Glass Golem". The only other thing that sticks out to me is the 6 move. If it was me, I'd make it 5. Any reason for 6? The 6 move was both thematic and practical. Due to her size it made sense she would have a larger stride than medium figs which typically have 4 or 5 movement. Also, with Shatter Point, I found in play testing that, while not useless, was not wholly effective with slower movement. I am not against making it 5, I just thought 6 suited her better. I figured as much, and I'm reassured that you tested both ways. 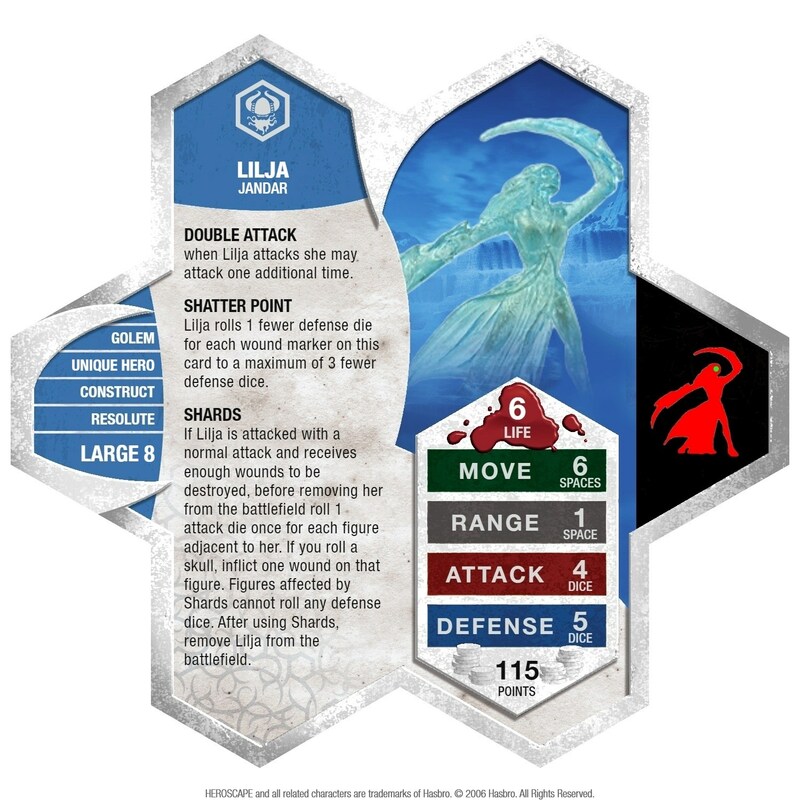 On the Shards ability is it supposed to be "one attack, or one attack die"? How it is worded it seems that she gets to attack each figure adjacent. I would assume it is similar to the frost giant of morh ability dying swipe. I'd bet on "attack die," since I doubt LC would go for actual out-of-turn attacks. Indeed, you roll one die for each figure. It's wording cribbed from Dying Swipe, although it's slightly out of context. It should probably have the word "die" added into the text. It looks like it was accidentally left out. The card has a unique flavor that I like. I do think that would make it clearer. I am so sorry for all the confusion. When I swapped her over from uncommon to unique I inadvertently deleted the word "die". It is a milder version of Dying Swipe.